When you meet Elaine and talk to her about her passion for art and for life, you might never guess that she was homeless. Elaine attended college, worked in a series of white collar jobs including mortgage financing and insurance and had a family. Elaine had been a homemaker for 12 years when her partner had a stroke and had to be moved into a facility that provided professional care. Elaine had grown to rely on her partner’s income and his sudden disability, left her without support and without a home. Terrified and grieving, Elaine says that “the idea of being alone, of not having a home” and of being in an “overwhelming situation” made her turn to drinking. Despite her addiction, Elaine continued her life. She found an apartment and went back to school to study medical billing and insurance coding. She sustained her own apartment for three years, then her mother died and her son began to show symptoms of a serious mental illness. After struggling with work amidst her personal strife, Elaine was evicted from her apartment and became homeless. She bounced from couch to couch—never having a place of her own and being unable to get work because she was caretaking for her son. Meanwhile, she fell further and further into alcoholism. She also suffered from serious depression, PTSD and a mood disorder. Eventually, Elaine entered a five-month rehabilitation program at the McAlister Institute. She emerged from that program sober but without a place to live. The program referred her to Father Joe’s Villages and she was admitted into the Transitional Housing program in the Paul Mirabile Center. At Father Joe's Villages, Elaine began to heal from the trauma and stress of her personal life and mental health issues. She accessed many programs at Father Joe’s Villages, including Chaplaincy Services, Mental Health Services and Employment & Education Services. Elaine saw a therapist and psychologist through Mental Health Services. She learned to confront her PTSD by attending a therapy group for people suffering from PTSD called Seeking Safety and manage her diagnoses. Elaine also accessed Employment & Education Services, including an interview class and a computer class. Elaine was and still is very involved in Chaplaincy Services. She attends Health & Wellness groups, including Tai Chi and our art workshop. After joining the art workshop, she began creating art again—a passion that she neglected over the years. 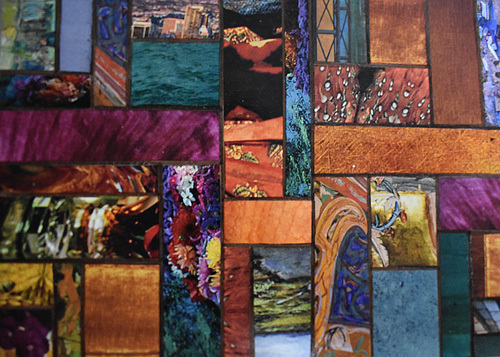 She sat in her bed in the Transitional Housing program late at night using the supplies made available to her to create beautiful collage mosaics that looked like stained glass. This is when began to rediscover her creative spirit. Now, art is “not something I’d ever leave behind,” Elaine said. She also found spiritual enrichment through Chaplaincy Services. She attended weekly sessions with a chaplain who provided spiritual support and attended Father Joe’s Villages’ chapel services regularly. She went to the bible study weekly and the Chaplaincy Services’ Women’s Conversation Group. “The chaplaincy program is great. I would tell more women to get involved in chaplaincy,” Elaine said. After some time in the PMC “building her self-esteem and strong self-preservation,” Elaine entered a Permanent Supportive Housing program. She now has a home of her own in Cypress apartments and has maintained permanent housing for six months. She, and the other tenants at Cypress, receive regular support from two Father Joe’s Villages’ Tenant Services Coordinators whose job it is to help people in the building maintain housing stability. 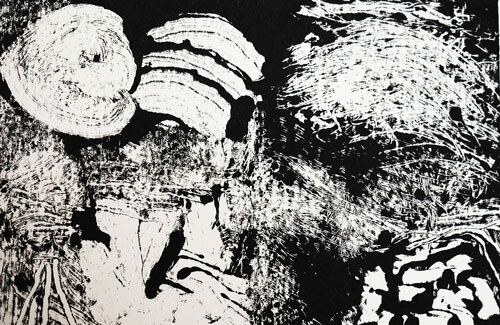 Elaine has recommitted to her art and currently makes mono prints—painting on glass and then making a print on paper. “I’ve always done art and loved it, but didn’t have the discipline.” Now, she’s working on marketing her work to local galleries and selling prints in local businesses. Two of her pieces are being printed as cards for Second Story Cards in Washington, DC and she’s currently working as an illustrator for a children’s book by a local writer. She’s also been asked to host a weekly art workshop for her apartment complex. “I feel like it is my duty to use my gift,” Elaine said, describing the importance of her art. "It’s a God-given gift and it pleases people. It’s like how someone who has a good voice feels compelled to sing. And, it’s very spiritual. I feel like I’m displaying God’s work."